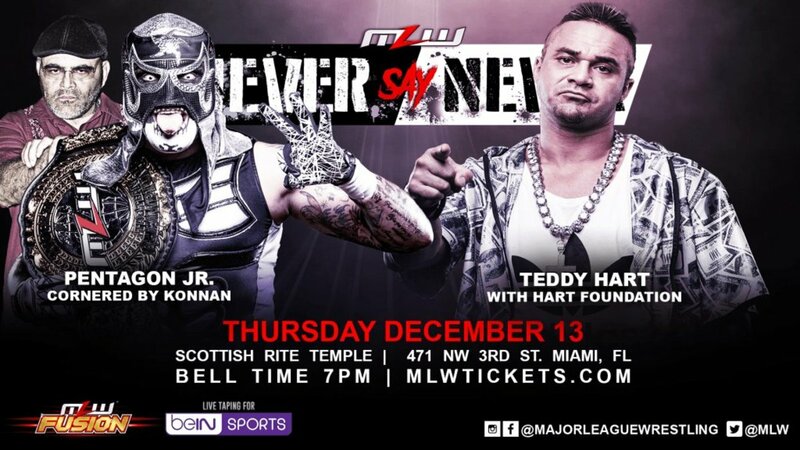 Kicking off two straight nights at the venue, MLW was at the Scottish Rite Temple in Miami, Florida on Thursday for a set of television tapings called "Never Say Never." MLW will hold a live special on beIN Sports and tapings tonight. - Tom Lawlor defeated Simon Gotch in a "no holds barred fight"
There were no ropes for this match and you could only win by knockout or submission. After the match, Lawlor cut a promo about challenging Low Ki for the MLW World Heavyweight Championship at MLW Superfight on February 2. - Salina de la Renta and Ricky Martinez came out. De la Renta cut an anti-Miami promo, mentioning that it's Konnan's city. Konnan interrupted her and said he will become MLW World Heavyweight Champion by defeating Low Ki at Friday's tapings. Pillman pinned Dreamer after giving him a low blow with a cane. PIllman and Dreamer will face each other in a Singapore cane match at tonight's tapings. Ricky Martinez laid out Brazil after the match. DJZ was making his MLW debut here. Xavier and Everett were both making their MLW debuts. This was also Lee's MLW debut. Barrington Hughes came out after to have a staredown with Romero. Rush said he wants to face LA Park and is bringing Los Ingobernables to the United States. - Teddy Hart defeated Pentagon Jr.
Pentagon & Fenix were originally scheduled to defend their MLW Tag Team titles against the Hart Foundation on this show before Fenix suffered a groin injury last month.